Chamundai and I are in the air between Kuala Lumpur and Chennai on our way to the Divine Mother Navaratri celebrations going on all throughout India. In only 3 or 4 hours we will be in Peedam, in the presence of a Divine incarnation, our guru Sri Sakthi Amma. My soul has already started to respond to the forthcoming physical plane reunion with Amma in a way that I am sure some of you will recognize. I am aware of a deep stillness combined with a feeling of anticipation, and an inner, energetic trembling, as a lot of sacred alchemy and spiritual activation has already begun to take place. My heart chakra is being initiated once again, and feels like it is burning from the inside, but in a blissful way. And we are not even physically there yet! I would like to let you know about a beautiful spiritual opportunity that has just manifested, and share with you what happened at the Abode of Peace in Cooranbong last weekend. On Sunday, for the first time I ran a seminar about Angels, particularly our Guardian Angel. Anandanetti and the Peace Angels were in attendance and we had a beautiful time. 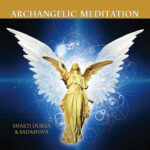 The energy was very high, and a lot of teachings were given about Angels during the day. During our afternoon session we placed large selenite and other crystals in a particular shape and to our delight and surprise, a portal opened into the realm of the Archangels. Each person in the class came and stood in the portal and received a blessing, which most felt. Even more amazing, after we finished the session, guidance came to move all the crystals into the Shakti temple, and to set up a new Angel altar. When we did so, I realized that the Archangelic portal did not close, but it had just become a whole lot stronger. By standing in the newly formed Angelic portal, one can feel the incredible blessings of the Angels. Twenty or thirty people during that evening came and experienced the portal. It appeared that everyone was affected in some way. Some spontaneously burst into tears of joy, and others saw brilliant light. Other people went into bliss, and others had such strong energy running through their body that they went into various body postures or kryas as they are sometimes called in yoga. We were shown that this portal will grow stronger with usage, and provide a permanent enhancement of the natural link between humanity and the Angelic kingdom. Intuitively it seems that many priceless blessings and a whole lot of Divine guidance will be imparted through this portal, which is being maintained now by the Divine in the form of the Holy Spirit. As with all things spiritual, to those whose hearts are closed or whose minds deny the existence of such mysteries, they will just be a bunch of crystals at a particular location in space and time. However, to those who yearn to experience the blessings of the Angels in quite a powerful way, you can now do so in the sacred space of our contemplation temple in Cooranbong. Anyone is able to go into the temple and stand in the Angel portal. You just go into your heart, ask to be blessed by the Holy Angels, and be receptive. And streams of energy, love, bliss and light will pour into you. The more this boon is appreciated and used, the stronger it will become, what a blessed world we live in! I thought big things were afoot, and somehow it seems that the Angelic Portal is just the beginning of a new chapter in the tremendous gifts being shared with us by the Divine.